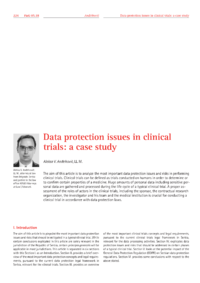 The aim of this article is to analyze the most important data protection issues and risks in performing clinical trials. Clinical trials can be defined as trials conducted on humans in order to determine or to confirm certain properties of a medicine. Huge amounts of personal data including sensitive personal data are gathered and processed during the life cycle of a typical clinical trial. A proper assessment of the roles of actors in the clinical trials, including the sponsor, the contractual research organization, the investigator and his team and the medical institution is crucial for conducting a clinical trial in accordance with data protection laws.